A few months ago, one of my students sent me a very interesting image of a 1000-armed Manjushri!!! 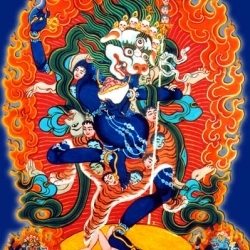 I have never seen this form of Manjushri before, and instantly fell in love with Him!! I quickly got JJ to help me find more information on this beautiful form of Manjushri… and thought that I should share whatever was found with all of my blog readers. 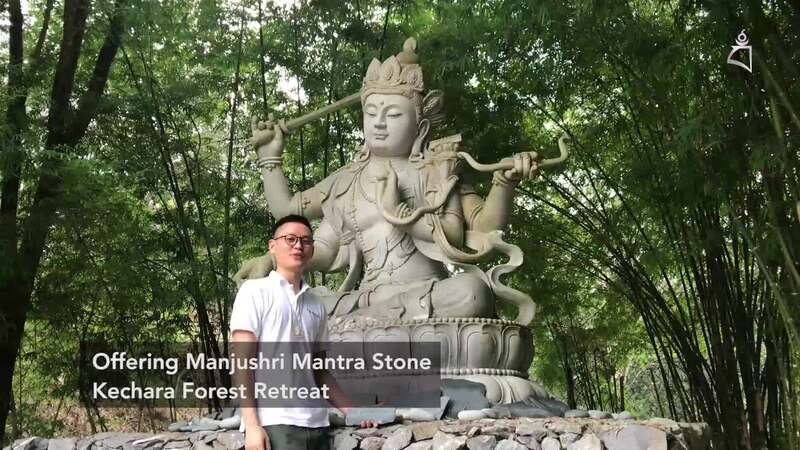 This form of Manjushri is mainly found across China and Taiwan… Manjushri has always been one of my favorite Buddhas… I don’t know why, but I feel very close to Manjushri… I like any Buddha that can increase our wisdom and intelligence. 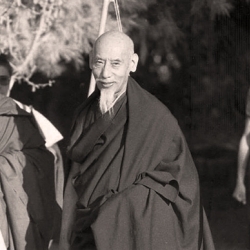 To fully understand the Dharma, not just intellectually, but to understand it to the point where we can apply it and have some realizations, we need wisdom and intelligence… Do read the beautiful sutra translated from Mandarin Chinese by JJ. I love this Manjushri emanation so much that I had JJ help make one for me… and beautiful 1000-arm Manjushri just arrived at my Ladrang a few weeks ago! 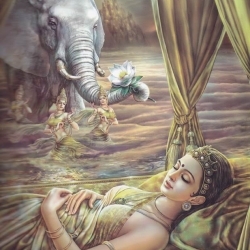 Do look at the pictures below… Manjushri is stunning!! My beautiful 1000-Arm Manjushri in the Ladrang. This picture was taken a few days after He was invited into my room!! A few days later, I had Joy and helpers painted Him. Real gold was offered onto Manjushri’s face. Painting the many Buddha Shakyamuni’s that Manjushri holds!! Two of Manjushri’s arms being painted black and gold. Lots and lots of arms being painted!! Mantras that are specifically placed inside the statue at the stomach area. 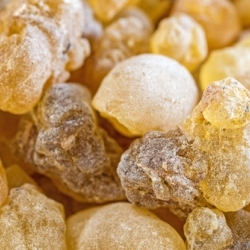 Holy relics are sealed tightly with a ziplock bag and wrapped in a yellow cloth. Other items that are placed inside the statue are potpourri and mothballs. Everything is kept in place with a yellow cloth, and then a wooden base is hammered on. Lastly, a red velvet cloth is placed under the lotus base. The different parts of the 1000-arm Manjushri statue coming together. Manjushri with His gold face and features painted in. Lord Manjushri looking very regal! 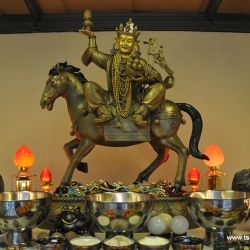 Wonderful well done job… Manjushri looks spectacular! Joy is a talented artist that has been with me for many years now. She does the paintings on most of my personal statues. This statue of 1000-arm Manjushri is truly one-of-a-kind. A close-up view of Manjushri. 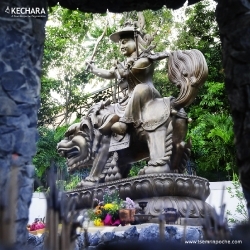 The very first 1000-arm Manjushri statue in Kechara! 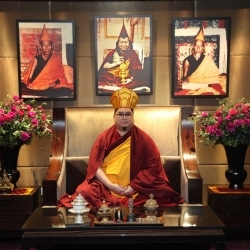 What a perfect Buddha… He has now been invited into the Ladrang. Each of Manjushri’s hand has a Buddha Shakyamuni statue. Thus have I heard, at one time Buddha Shakyamuni was in Maheshvara Heaven in the palace of Vinangkamuni. The Buddha was on his many jeweled throne together with the Buddha Vairochana in the assembly of Vajra Sagara speaking of this Sutra. Present were many Devas and Brahmas and an assembly of Bodhisattvas and Mahasattvas. In the assembly there was a Maha Arya Bodhisattva Manjushri who has a golden body. From his body emanated a thousand arms, with a thousand hands, each holding an alms bowl. 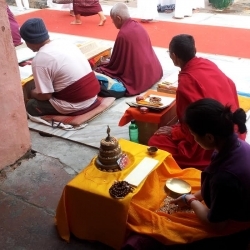 From within these alms bowls comes forth a thousand Shakyamuni Buddhas. The thousand Buddhas continue to manifest limitless emanations. Visualization of the syllable AH, leads us into the Deathless State is the embodiment of Tathagatha Vairochana. Visualization of the syllable RA, leads us into the nature of Emptiness free from defilements is the embodiment of Tathagatha Akshokbya. Visualization of the syllable PA, leads us into the insight that all Dharmas have been “Expounded in the ultimate sense, the embodiment of Ratnasambhava”. 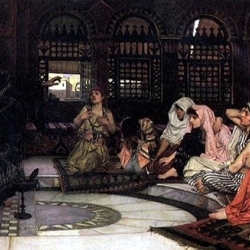 Visualization of the syllable TSA, leads us into the insight that the arising and ceasing of things cannot be apprehended because in reality there is no arising or ceasing, the embodiment of the Tathagatha Avalokita. Visualization of the syllable NA, leads us into the insight that all things are void of true nature, the embodiment of Tathagatha Amogasiddhi. 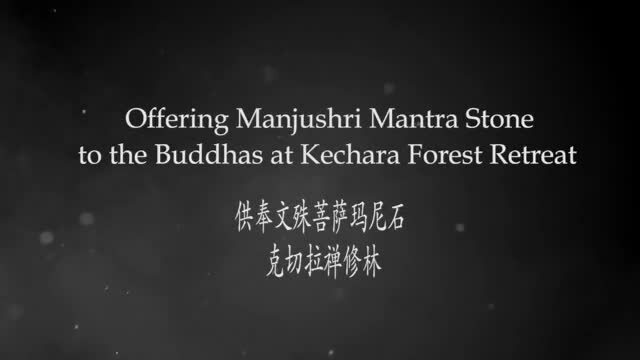 From the 1st and 5th chapter of the Thousand Arm Manjushri sutra, there’s a detailed description of how Manjushri manifested himself in this particular form. His full name the Exalted One 5 peaks 5 wisdoms 1000 arms, 1000 hands, 1000 alms bowls, 1000 Buddha Shakyamuni Manjushri Bodhisattva. The name for this form of Manjushri comes from the fact that he has 1000 arms and each hand carries a monk’s bowl. In the Dunhuang Caves of 1000 Buddhas, there are two depictions of this form of Manjushri. 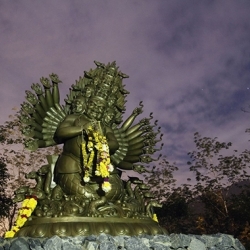 Found in the 6th cave, Manjushri is depicted sitting or standing atop a lotus flower as big as mount Sumeru. He has 5 hair knots, a Buddha adorns his crown and he wears precious jewels and garments on his body. 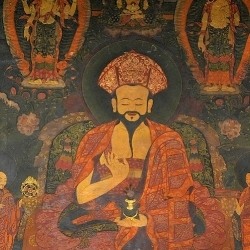 The first two hands is held at the level of his chest, the left hand holds an alms bowl with a Buddha Shakyamuni inside. 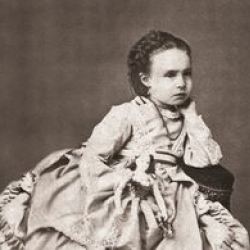 The right hand is held upright with both thumb and index finger touching each other. 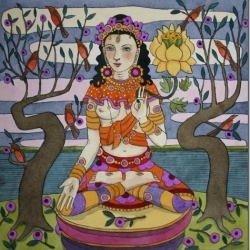 The second set of hands is held at the level of the waist in meditation mudra holding an alm’s bowl with a Buddha inside the bowl. The remainder 1000 hands is divided by 6 levels, each level . There are 200 main hands which are found in the 72 cave. He wears the 5 Buddha crown and hands are stretched open forming a full moon. These wall paintings are from the Soong Dynasty and are part of the murals from the 1000 Buddha Caves in Dun Huang. Based in Taidong, Taiwan; this monastery holds the duplicated form of the Thousand Arm Manjushri statue from Chong San Monastery, Tai Yuan City, China. … there are 1,000 bowls! The full frontal view of the 1000-armed Manjushri statue. Chong San Monastery is located in Tai Yuan City, China. 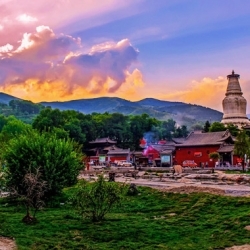 It was originally named Bai Ma Monastery (also known as White Horse Monastery). 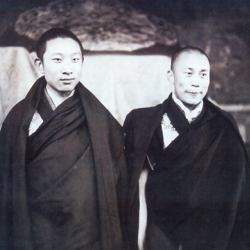 During the early Ming dynasty (1383’s), the monastery was renamed to the name we know of today. The 1000 Arm Manjushri statue is located in the Compassion Hall of Chong San Monastery, along side with the 11 faced Thousand Arm Chenrezig and Samantabhadra. All 3 statues stand at 8.5 meter high. Beautiful 1000-armed Manjushri on the altar. 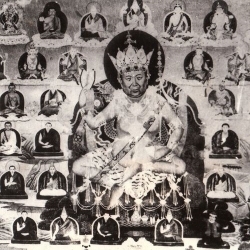 An antique image of the 1000-armed Manjushri in Chong San monastery. The state stands at 8.5 metres tall! The altar in Chong San Monastery. Entrance of Chong San Monastery. Beautiful altar, so many offerings placed in front of the Buddhas! Mogao Cave, also known as the Caves of the Thousand Buddhas have over 492 temples, located 25 km southeast of the center of Dunhuang which is strategically located on the Silk Road in Gansu province, China. 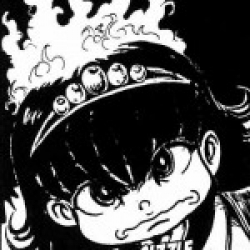 The earliest cave that was identified is cave no. 361 in the mid fourth century and the biggest cave is no. 99. The Thousand Arm Manjushri murals are found in caves no. 14 and no. 114. There are over 16 wall paintings in these two caves. At the crown of Manjushri, he wears a Buddha crown. Wearing a heavenly clothes with 4 arms in front of the chest holding two bowls with a Buddha inside, and one thousand arms around the body. The arms that layer closer to Manjushri’s holy body contains Buddhas inside the bowls, while the arms at the outer layer contains no Buddha images inside the bowls. Above Manjushri’s body is a parasol with sun and moon on both sides. Images of Boddhisattvas and protectors surrounds Manjushri, with 2 naga kings below Manjushri. Xiantong Monastery is located in Shanxi province, China. It was built in the Qing dynasty, and during this time, a beautiful 1000 Arm Manjushri was built in the Thousand Bowl Manjushri Hall. It stands at 5.4 meters. The 1000 Arm Manjushri here is depicted as having five heads and ridding on a lion. He has as a golden body, wearing heavenly clothes, jewels and the 7 Buddha crowns. Two of his arms hold Shakyamuni Buddha on the crown of Manjushri’s head, two arms on the cheeks while holding 2 bells, another two arms on the chest with the left holding a bell and right hand holding a bell; and 1000 arms surrounding His holy body, with each arm holding a bowl with a Buddha seated inside. Entrance of Xiang Tong Monastery. 1000-armed Manjushri on the altar. A very unusual, but beautiful form…. « What do you think of this project? 25 Responses to 1,000-armed Manjushri!!! Thank you for sharing such beautiful form of Manjushri. I’m in total awe when browsing through picture to picture, simply magnificent! 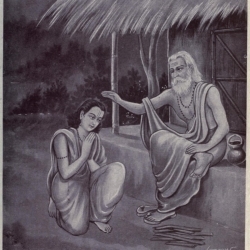 Thus filling the entire Dharmadhatu. One of the best depictions on how a Buddha can manifest infinite in number to help sentient beings, just like the 1,000-armed Manjushri! Great work also from Joy and the team of in-house artists, rejoice for all to have such great merits to paint rare Buddha statue! I pray that in this and future lives I’ll get closer and never be separated from Manjushri, pray that I’ll be able to gain penetrative insight and to understand and realise the ultimate truth. Another post which I think you may like is this one totled 7 FEET-1000-armed Avalokiteshvara arrived!! No we did not need to paint this one but you can read all about how we invited the Great Buddha of Compassion into Rinpoche’s house. Do let us know what you think after reading. Enjoy! Yes Lhasa Kangyur Volume 91 roman pecha page (the numbers occur at the right top corner) 167 line 4 to 168 line 7 – the dharani of the 1000 armed manjusri although this is not mentioned in the tibetan text. There is no dharani given on pecha page 190 line 7 Volume 91 Lhasa Kangyur except for pecha page 194 line 1 om vAk ye dam na ma svA hA. in the text about the 108 names (tshen gyatsa gyed)of manjusri .But it is not mentioned that the dharani is that of the 1000 armed manjusri. 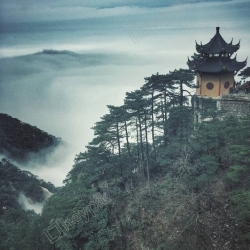 Wutai shan is supposed to have an image of the 1000 armed Manjusri. I wonder if there is a 1000armed Maha Vajrabhairava? Thank you Rinpoche sharing all those beautiful images of 1,000-armed Manjushri .May all of us be blessed by these glorious forms of Manjushri. All these beautiful forms of Manjushri is indeed very unique.I do hope i could one day visit the very first 1000-arm Manjushri statue in Kechara! and painting of the beautiful Manjushri at Kechara. Thank you for sharing this holy form of Manjushri. Manjushri is such an important buddha because without relying on him, we could not acheive enlightenment. Thank you Rinpoche for sharing the long mantra of this form of manjushri as well. Oh my word, stunning would be an understatement. I feel like prostrating to these glorious forms of Manjushri. They just have such a magnificence to them. May I and every being be blessed by the glorious Manjushri to practice the dharma too. Appreciate the effort by the Kecharians who assembled and installed the great buddha statue. How very meritorious. Also, to remember and recite the long mantra of the 1000 armed Manjushri seems hard but I am sure some diligent practitioners do it. Hi, I am interested to know how to translate the dharanis from Chinese characters to Sanskrit, can anyone who knows how please share it with me. You can email to me directly or write here. Gassho!!! Lovely painting by Joy and team for Rinpoche’s Ladrang 1000 arm Manjushri. Thank you PJJ for the info and translation on 1000 arm MAnjushri. The 1000 arm Manjushri is indeed beautiful and rarely seen in temples. 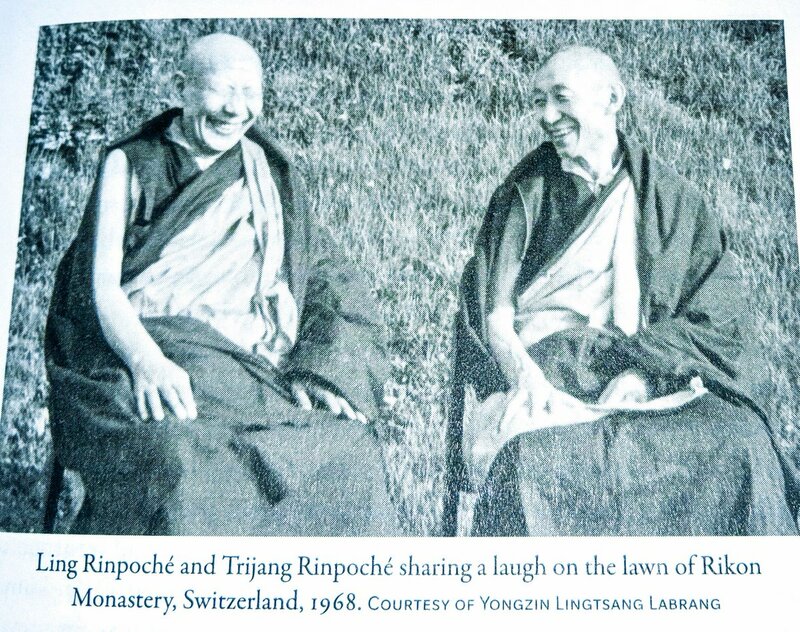 Thank you for sharing, Rinpoche. Dear admin, I am writing in representation of the original artist and owner of the last three pictures under the section of Description of 1000 Arm Manjushri (the digital arts version). He firmly requests that his pictures and the relevant descriptions be taken down the soonest. A really amazing 1000 armed Manjushri, not a very common type of Wisdom Buddha. With wisdom the Buddha can employ many types of skilful means to save sentient beings. May more and more of this imagery be replicated around the world and bless all beings. These are wonderful images of the glorious Buddha Manjushri. This form of Manjushri is very unique and beautiful. Manjushri’s practice is perfect for students like me. Thank you Rinpoche for sharing this stunning thousand arms Manjushri so bless to look at him. I must said Joy and Andrew do a good job so nicely paint and so much hard work. So awe-inspiring! Thank you very much, Rinpoche. That masterpiece is a labour of love. Such stunning work. Would love to get a view of it up close. Thank you Rinpoche for sharing all these amazing magnificent 1,000-armed Manjushri, this is really an eye opener for me and visual blessing as well! Holy cow! Joy and Andrew really did transformed the bare statue into a real piece of art! 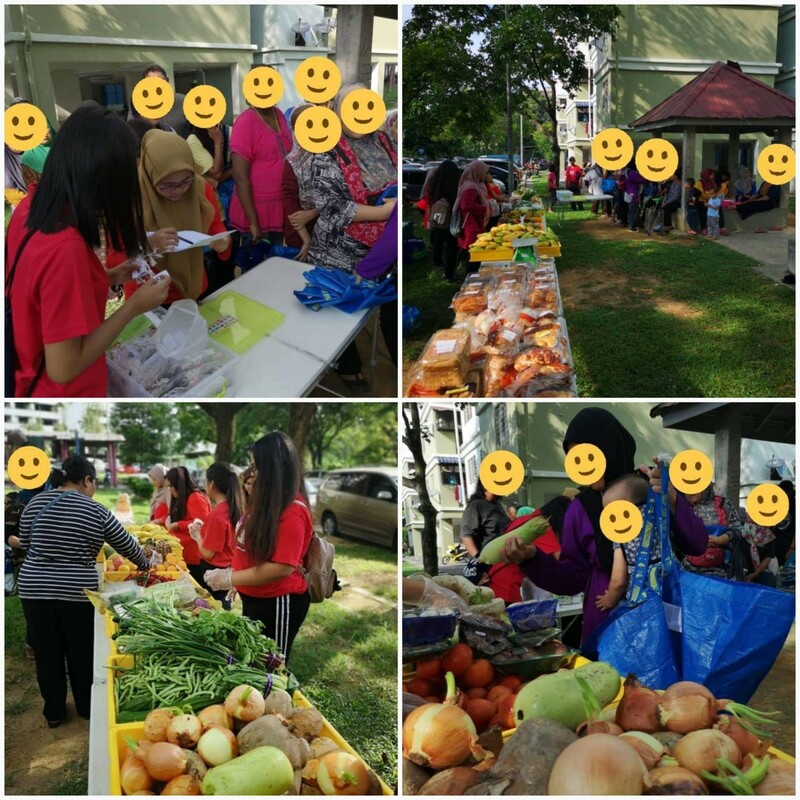 The rest of the blog contents,the sutra in Chinese was too much for me, the category of people whose mental capacity like Chuda Pandaka. But I’ll be back to read more to understand them later. So is this sadhana, Do you have a .pdf of it for easier printing?